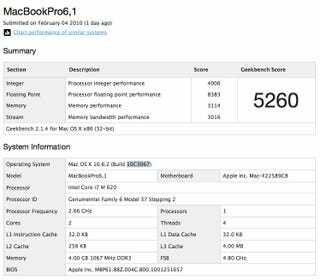 Are These the First Core i7 MacBook Pro Benchmarks? There's a pretty gnarly GeekBench result running around which appears to be for a new model MacBook Pro—6,1 to be exact—running a crazyfast 2.66GHz Intel Core i7 620M, one of the Arrandale chips Intel announced at CES. MacBook Pros are definitely in need of fresh guts, and the obvious choice for chips are from the fresh batch of Arrandale processors Intel announced last month. The Core i7 620M would definitely fit the bill—it's a fast dual-core chip, and its TDP is in line with what's in the currently shipping MBPs. The GeekBench score is 5260, which MacRumors notes handily bests the current-gen 2.6GHz MBPs, which typically hit around 3700-4000. Not answered by the Geekbench results is what's up with the MacBook Pro's graphics situation. What&apos;s Inside the Next MacBooks? In case you're not familiar with the way model numbers work at Apple, like the MacBook Pro 6,1 here, the first number in the set designates a major revision, and the second number indicates a smaller subset—the first unibody MacBook Pros were 5,1 for instance. And it's not unheard of for new hardware to come with a slightly custom build of OS X, like the 10C3067 seen here.